When big countries reach agreement, small countries may pay the price, says Ambassador-at-large Bilahari Kausikan in a speech he delivered in Tokyo this week. The excerpt below includes notes prepared in anticipation of questions. President Xi Jinping has termed the Chinese Communist Party's (CCP's) role as leading the "Great Rejuvenation" of the Chinese nation after a century of weakness and humiliation. But the outcome of the second phase of reforms, even if completely successful, will be slower growth, as the CCP has itself acknowledged. The "Great Rejuvenation" must therefore be as much, if not more, outwardly than internally directed. Externally, it is increasingly an essentially revanchist narrative. Herein lies the importance of the South China Sea (SCS) to China. Put simply, it is the least risky way of putting some shreds of meat on the bare bones of the historical narrative by which the CCP justifies its right to rule. The United States defines its interests in the SCS in terms of upholding international law and freedom of navigation (FON). These are important interests but not of the same order as the CCP's primary interest, which is existential: the legitimacy and ultimately the survival of the CCP. The US has made clear that the US-Japan alliance covers the Senkakus; it has been ambiguous about the US-Philippines alliance, and hence in effect made clear that it does not cover the disputed areas in the SCS. War in support of the principal US East Asian ally is credible, if unlikely. War over rocks, shoals and reefs would be absurd. 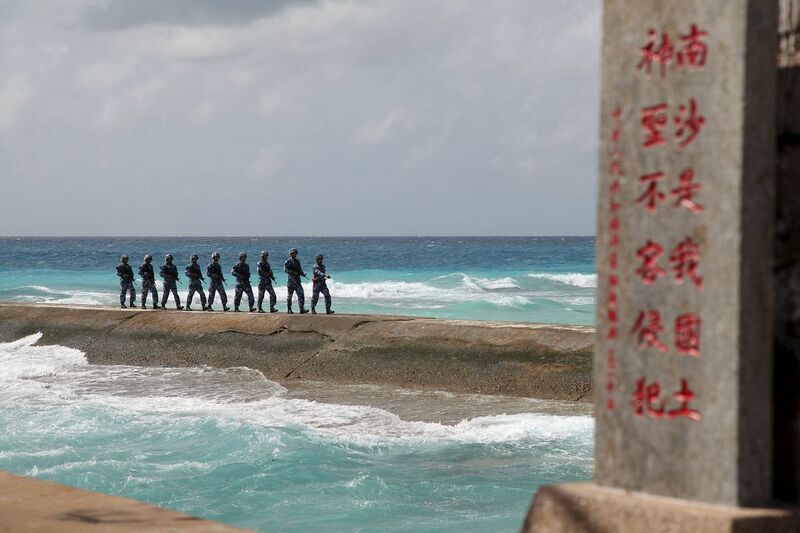 I doubt that China can be deterred from continuing its reclamation activities and deploying military assets on the artificial islands it is creating. But I doubt too that China can deter the US from operating in the SCS. Military assets that cannot be used are a weak deterrent. To use them to deny access must evoke a US response. This confronts the CCP with Hobson's choice: escalate and risk war or at least serious conflict which will jeopardise CCP rule; or respond weakly, which will expose the hollowness of the "Great Rejuvenation", which will also shake confidence in CCP rule. The CCP will not willingly place itself in such an invidious position. China's bluster masks this dilemma. Beijing has carefully kept each action in the SCS below a threshold that must draw a response from even the most reluctant of US administrations. Miscalculations and accidents can of course happen. If an accident occurs, the highly nationalistic public opinion that the CCP both cultivates and fears could lead Beijing down a path it does not want to travel. But the probability of accidents can be minimised. China has of late taken a more positive attitude towards rules of engagement for unplanned encounters at sea and in the air. If we look past the chest-thumping by both sides, the probability of US-China competition in the SCS becoming ritualised is not to be discounted. I think the process is already under way. In my view, there are less differences between the US and China on FON than immediately meets the eye. I think differences over what military activities are acceptable in another country's Exclusive Economic Zone (EEZ) reflect differences of capability rather than irrecon- cilable differences of concept. China says that it has not and will never impede FON in the SCS. This is credible in so far as the merchant marine is concerned because China, too, is a trading nation. The US riposte is that there is a difference between FON granted by the leave and favour of a major power and FON as a right enshrined in international law. This is true. But the US is not a party to the United Nations Convention on the Law of the Sea (Unclos) and says it considers Unclos largely customary international law and abides by it on that basis. It does not take an extreme sceptic to consider this a gentler way of saying that the US too grants FON by its leave and favour, because of a particular calculation of American national interests and not an obligation it must fulfil irrespective of such calculations. Some American interpretations of FON have been questionable, for example, when it tried to assert the right to stop and search vessels on the high seas under the Proliferation Security Initiative after 9/11. One may have more trust in one major power's leave and favour than another's, but that is a matter of political choice and not international law. There is at present a difference of interpretation between the US and China over what military activities are permissible under Unclos in another country's EEZ. But is this an irreconcilable difference of concept or does the apparent difference of concept reflect only a difference of capability? I am not so sure. The US has made clear that the US-Japan alliance covers the Senkakus; it has been ambiguous about the US-Philippines alliance, and hence in effect made clear that it does not cover the disputed areas in the South China Sea. War in support of the principal US East Asian ally is credible, if unlikely. War over rocks, shoals and reefs would be absurd. In 2014, China sent an uninvited surveillance vessel to the RIMPAC exercise that was being conducted off Hawaii. That same year, it conducted a major naval exercise in the eastern Indian Ocean between Christmas Island and Indonesia. Last year, the PLA Navy rather cheekily sent a flotilla through US territorial waters off Alaska while President Barack Obama was visiting that state. The PLA justified its actions in terms that could have been used by a spokesman for the Seventh Fleet. At present, the PLA Navy can only make such deployments sporadically. But its capabilities will develop and as capabilities converge so may concepts, and as concepts converge so may interests. Over time, a more symmetrical naval equation must develop in the SCS. When this occurs, it is likely that some implicit or de facto agreement over the SCS will be reached between the US and China. When this occurs - and I believe it is more a question of when and how, not whether - countries like Cambodia and the Philippines which now define the extremities of the positions of Asean members on the SCS may well find themselves too far out on a limb for comfort. When big countries reach agreement, they generally try to make small countries pay the price. Nothing I have said is intended to imply that the US presence in South-east Asia is unwelcome. But in South-east Asia the American porridge is always going to be too hot or too cold. It is extremely difficult to get the temperature just right to suit the tastes of all countries in a politically diverse region. Some countries will always fear abandonment while others will always fear entanglement. This is the reality that inevitably confronts an offshore balancer and its allies. It is one of the burdens of global power. But, of late, the US has itself unnecessarily added to its own burdens. American intervention in Iraq, and later in Libya and Syria in support of the UK and France, left those countries irrevocably broken. But the US is now doing its best to walk away. When the "Arab Spring" broke out - a singularly inappropriate metaphor because after spring inevitably comes summer and Arab summers are notoriously hot - within the space of a mere week, the US shifted from treating President Hosni Mubarak as a valued and steadfast 30-year ally to unceremoniously dumping him. In South-east Asia, this evoked echoes of how the US had treated President Suharto, another 30-year ally. The US drew a "red line" in Syria which quickly faded entirely away as the Obama administration desperately grabbed at the threadbare line thrown to it by Russia. And all this at a time when China was constantly reminding Asean in ways subtle and not so subtle that it was a geographical fact, whereas the American presence in South-east Asia was only a geopolitical calculation. In this respect, the metaphor of the "pivot" or "rebalance" was also inappropriate, connoting discontinuity. What "pivots" or "rebalances" one way could swing another. Instead, the stress should have been on the essential continuity of US policy in East Asia over the last 30 years or more, which has the additional advantage of being true. The Trans-Pacific Partnership (TPP) helps mitigate the possibility of a sharp swing in US policy, but is not a substitute for political consistency. The American system impels each new administration to stress differences even when there is none. Do not assume everyone in South-east Asia understands the eccentricities of the US system and will discount political rhetoric. But I do not think that what Mr Donald Trump and Mrs Hillary Clinton have said about the TPP can be entirely dismissed as campaign rhetoric. They were responding to a political mood that any new president cannot ignore, whatever his/her own inclinations. Let me concede that Asean has not dealt with the complexities of the SCS particularly well. Asean's basic and enduring purpose is to maintain a modicum of order and civility in relations among its members in a region where this is not to be taken for granted. On this score, Asean has not done badly. But Asean is divided on the SCS and will remain divided. We occasionally are able to come up with useful statements on the SCS. Still, statements are only just that: Statements do not change realities on the ground. Asean constantly stresses its "centrality". But if Asean is "central", it is not because of our strategic weight but because our lack of strategic weight enables major powers to find Asean-led forums such as the Asean Regional Forum and the East Asia Summit occasionally useful, while remaining confident that Asean cannot frustrate their most vital designs. And if we look like doing something even minimally effective on the SCS, China will not hesitate to divide Asean, as it did in 2012 and again just a few weeks ago. I don't think China was behaving unusually. It was behaving as all big countries do on issues which they consider their core interest. If I am right about how China defines its primary interest in the SCS, then it connects directly with the most vital of all its interests. For a hundred years, the legitimacy of all Chinese governments has been measured by its ability to defend China's borders and sovereignty. The artificial islands may be of limited military utility, but they serve a vital domestic purpose and additionally impresses the natives - that's us - with China's inescapable contiguity. Of late, China has even taken umbrage at references to the disputed areas as being in dispute because they have been Chinese territory since "ancient times", or so they claim. What autonomy Asean currently enjoys on the SCS is due to the US presence, which is an irreplaceable element of the regional balance. But Asean does not define balance as being directed against one major power or another as during the Cold War. The small countries of South-east Asia conceive of "balance" as an omnidirectional state of equilibrium that will allow us to maintain the best possible relationship with all the major powers and avoid being forced into invidious choices. Avoiding invidious choices does not mean avoiding taking positions, lying low, saying nothing meaningful and hoping for the best. To duck on such a central issue as the SCS is to surrender autonomy. What it does mean is leaving open the maximum range of options when positions are taken. Balance in this sense requires psychological as well as material equilibrium; it is a frame of mind. The US is an irreplaceable component to the material balance. But while the US and its allies can build capacity in those Asean countries that are deficient, warships, fighter aircraft and submarines are necessary but insufficient conditions to maintain such a frame of mind. And as I have argued, some US actions have even undermined psychological equilibrium in South-east Asia. Internal developments in Asean members are crucial to maintaining psychological equilibrium. Here what happens on land is as important as what happens at sea. China's growing economic ties with South-east Asia and the many infrastructure projects planned or under way are binding south-west China and mainland South-east Asia into one economic space. This is to be welcomed on economic grounds but inevitably changes calculations of interest. It was a strategic mistake for the US and Japan to have stayed out of the Asian Infrastructure Investment Bank (AIIB). Japan is investing in South-east Asian infrastructure. But what Japan alone can do in mitigation is limited. If the US and Japan were in the AIIB, it would have had a greater effect. Fortunately, it is not an irreversible mistake. Asean countries are not alone in being psychologically vulnerable. It was not too long ago that a former Australian prime minister concluded, for broadly similar economic reasons, that Australia's alliance with the US had become a strategic liability. If Singapore has been more resistant to this Chinese tactic, it is not because we are less venal than others or because of our superior wisdom, but from harsh necessity. We are the only ethnic Chinese- majority country in a region where the Chinese are typically a less-than-fully-welcome minority. We organise ourselves on the basis of multiracial meritocracy where typically countries in our region organise themselves on the basis of the dominance of one ethnic group or another. China nevertheless constantly refers to Singapore as a "Chinese country" that should therefore "understand" China better and hints at undefined but vast rewards if we should "explain" China to other Asean countries. We politely but firmly tell the Chinese that we are not a Chinese country. We understand all too well that when the Chinese seek our "understanding" they mean "obey" and by "explain", they mean use whatever influence we may have in Asean on their behalf. If we were ever foolish enough to accept their characterisation and do their bidding, the multiracial meritocra- tic compact on which independent Singapore rests would be at least severely strained, if not broken. Singapore's success rests on this foundation of social cohesion. Once lost it will be very difficult if not well-nigh impossible to regain, particularly if the Government is regarded as complicit. But it would be equally foolish to alienate China which, even at a slower rate of growth, is going to be a major factor in our economic future. Maintaining a good relationship with China, while retaining the autonomy to pursue our own interests as we define them, is not a matter of choice; for us, it is a matter of survival. We have so far managed this delicate balancing act. But Singapore is only 50 years old and not all our compatriots understand this reality and are not immune to Chinese seductions. This understanding must be, has been and, I have no doubt, will sooner or later again, have to be enforced by the exercise of the coercive powers that are the legitimate monopoly of the state. And exercised in a way that is entirely in accordance with our laws, but will probably be regarded by some of our partners, the US included, as arbitrary and in conflict with values that they hold dear. We have also deployed such powers against American attempts to influence our internal dynamics and again, I have no doubt, we will have to do so again in the future.